I had just crossed the Ponte Vecchio Bridge from the south side when I realized something had startled me on my right. It happened so fast that it took me a few seconds to realize it, and by then, I'd walked past the source of my distraction. I scanned the crowd to see who else had noticed; surely, something so unignorable to me must be noticed by other people, I thought, yet no one else appeared to have noticed anything out of the ordinary. I decided to retrace my steps. Looking straight ahead, I walked until it happened a second time. I noticed that if I stood slightly to the right or left, the feeling went away; also, if I came back at a different time of day, I didn't have the same reaction though the beauty of the symmetry remained. So what was it about this lighting, these shapes, this visage that elicited the startle effect in me? And what exactly did I feel? I remember the sensation of selfless abandonment, a suspension in perfect balance outside the confines of time; the experience of ever-so-briefly being free of all notions of quantity or measurement; indeed of being beyond all notions of any kind. It is the feeling I strive for in my art though ironically I can only get there if I give up striving all together. 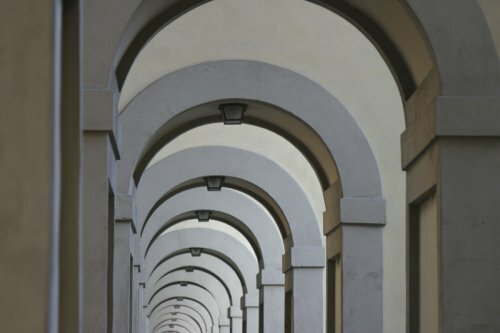 When I look at the image today, I want to run my finger through the arches as if it would fit, as though I could wear the the rings of the Uffizi as jewelry on my hand.